It’s normal for one of Europe’s big auto shows to host a variety of forward-thinking concept car reveals, but this year’s Geneva Motor Show included a rarity — the unveiling of a pair of concept tires by Goodyear meant to expand ideas about what tires can do aside from keeping a car on the road. The first, dubbed the BH-03, combines two fairly advanced technologies to generate electricity from the tire itself that could help recharge electric vehicle batteries on the road. A weave of thermoelectric fibers transforms the heat generated by the tire’s friction with the road into energy, while piezioelectric material does the same using changes in the tire’s shape as it moves. Goodyear didn’t suggest how much energy such a set of tires could potentially create, but said if put into production could ease EV owners’ range anxiety. 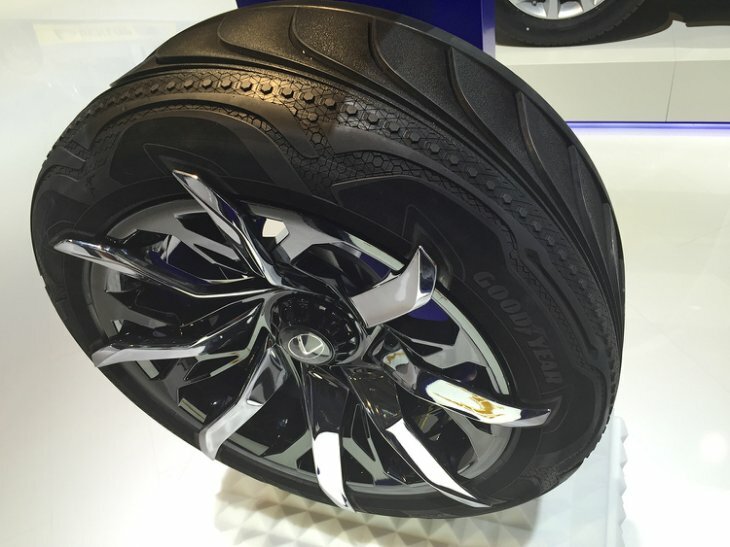 The second Goodyear concept, dubbed Triple Tube, debuted on the Lexus LF-SA concept. Much as most modern cars have adjustable suspension settings, the Triple Tube can adjust itself based on road conditions. Using, yes, three tubes instead of one, a sensor/compressor system and different bands of treads, the tire can inflate different chambers to either provide more grip for high-speed manuevers, lower rolling resistance for better fuel economy or maximum aquaplaning defense in snow and rain. 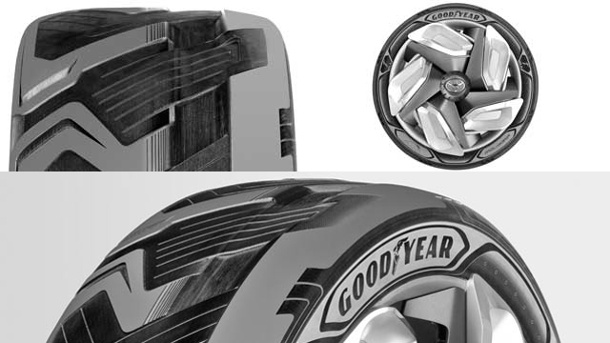 Goodyear noted that neither concept was close to production, but they demonstrate how much potential may lie in developing high-tech rubber. Several tire makers, including Bridgestone, have shown off airless tires for vehicles, although none have been proven useful for passenger vehicles yet. The tire business is a tough, commodity-driven game, with automakers and owners demanding the lowest price no matter what; even run-flat tires, the last big breakthrough, have struggled to gain acceptance due to replacement costs. If Goodyear can make the benefits of its breakthroughs balance the costs, the future could roll in on quite different wheels.